Today's story begins with another story, from another time and place: It's 1982, and I'm in the music library of Northwestern University. A few years earlier, I had been turned on to Casey Kasum's American Top 40, and I quickly found that following the charts tied in nicely with my expanding love of then-current pop music, my passion for playing with numbers (and math in general), and, in the years that followed, my burgeoning adoration and knowledge about the music of the '50's and '60's. Looking through all those magazines also afforded me the opportunity to look at the reviews, ads and other information about records which were released during all those years. This was wonderful for many reasons. 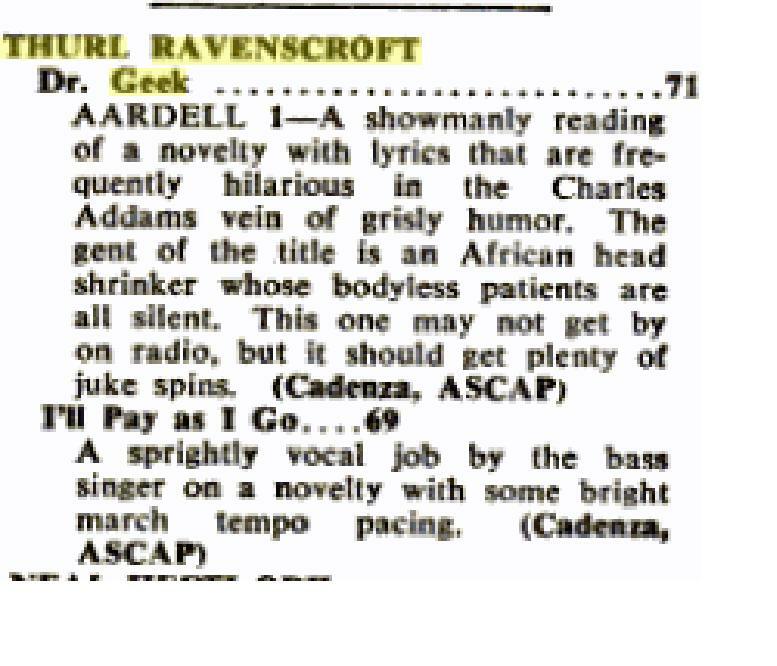 Among many examples: I got to see what Billboard had said, upon reviewing all manner of records that I loved, such as "Mecca" the most peculiar and wonderful 45 ever released by that most peculiar and wonderful of early '60's singers, Gene Pitney. I got to follow the shameful way the trade paper fell in line with the Red Scare of the early 1950's. More to the point for this story, I also got to find out about records I would never have otherwise known about, due to them being mentioned in ads or reviews. This was great in terms of many different artists I was interested in, and I developed a lengthy list of records to look for, in the front of my chart binder, but it turned out to be particularly helpful in terms of one of my other quickly expanding passions of the time - collecting records by Thurl Ravenscroft. I've written here multiple times of my Thurl-love, with posts here, here and here. 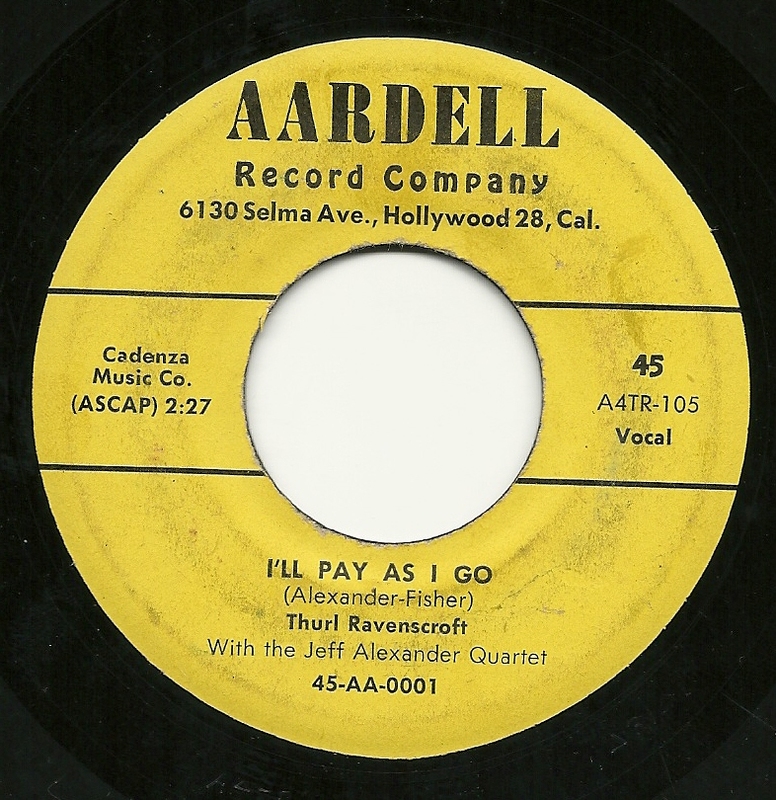 At the time I'm describing, I was still new to collecting Thurl, and I'd only discovered a few of the dozens of one-off 45's he made during the 1950's and early 1960's. Within Billboard, I found mention of about a half-dozen obscure records he had made, and over the next several years, these became among my most fevered "wants" in my collecting sprees. Two records eluded me for the longest period. One, "Jingle Polka" finally made its way to me about six years ago, in a batch of promo 78's, and it was featured in the first of my Thurl posts here at WFMU. The other, though, intrigued me (and my fellow Thurlphile, Stu), due to the titles on the record. 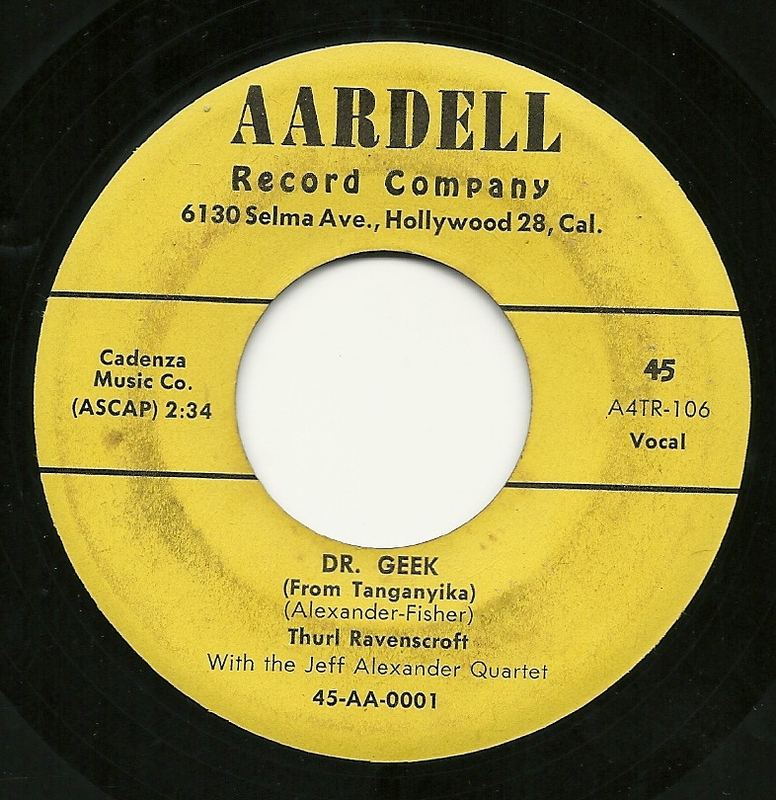 In one reference to the record I found, it was listed as "Dr. Greek". In another, it was listed as "Dr. Geek", with the flip side "I'll Pay As I Go". (I've found, and included a copy of one of those listings, as a jpg, below). For the ensuing decades, we often wondered to each other what on earth these songs could be: Was it "Dr. Greek" or was it "Dr. Geek"? And what the hell could "I'll Pay As I Go" mean. As I've indicated at length elsewhere , my collecting habit grew, evolved, mutated and became what many would probably view as out of control. But this was one record I never stopped looking for. For 30 years, I looked for in stores, in catalogs, in databases, and later, online in general and on eBay and Gemm in particular. And in all that time, I had yet to even see a copy of the thing, or to hear of the existence of more than one copy. About that one copy: a few years ago, Brian Jacobs, who runs the tremendous All Things Thurl site, managed to track down someone who had a copy of the record, and was gifted with a truly low-fi MP3 of the A-side, which I finally learned was titled "Dr. Geek (From Tanganyika)", and that it featured the Jeff Alexander Quartet. While this information did not end up helping me in the end, it did give me more to work with, in my searches. And the song itself was more than wonderful - complete with the second best insane laugh from Thurl that I've ever heard (the best one being here) - and from start to finish it was as weird and amazing as anything I'd hoped that a record called "Dr. Geek" (or "Dr. Greek", I suppose) could have been, even when heard in crappy quality. I included that low quality MP3 in my last Thurl update, a few years ago. Wonder of Wonders! The record showed up in an auction earlier this month. For the first time, I saw a scan of its label, and heard part of "I'll Pay As I Go", which did not disappoint, even while paling in comparison to its flip side. Year is 1956 according to the archives. I am so glad you finally got this record. And it is every bit as weird and great as we'd hoped! Brilliant! Looking forward to finally hearing it clearly. Love everything Thurl, and really appreciate you sharing this great find! Grrrrreat songs! Discoveries such as these prove why "Beware of the Blog" is the best blog ever! Thank you. I was tickled when I was 'backstage' at typepad the other day doing MY blog and saw that you had this cued up for a few days hence -- Always a thrill to get more of Mr. Ravenscroft for my collection. Cheers. I'm happy for you and particularly happy for those of who share your enthusiasm for Thurl. Great stuff! Heartfelt thanks, Bob.